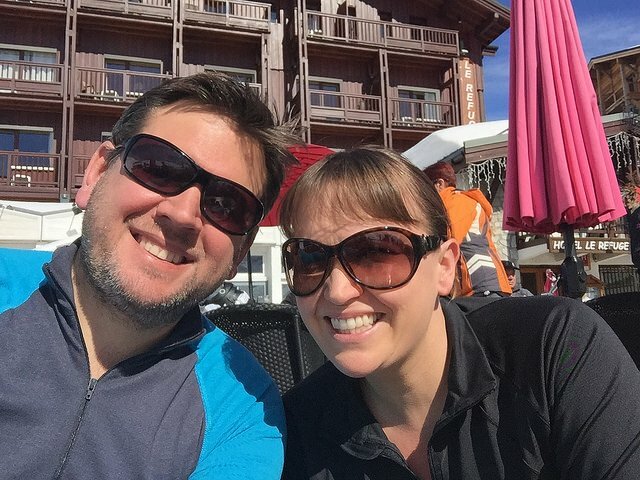 We were recently lucky enough to go on a fully inclusive ski holiday with Mark Warner. We stayed at an amazing hotel in Tignes called Chalet Hotel Aiguille Percee, and were lucky enough to experience some fantastic service from staff at the hotel, in particular the childcare staff I’ve already published a little video of our week but given the purpose of our trip was to ski, and for some of us to learn to ski, I thought I should really dedicate a full post to our experience of learning to ski on a Mark Warner Holiday and to explain whether Under 5’s can Learn to Ski! Mr Mini Travellers is a skier and tries to go every year. 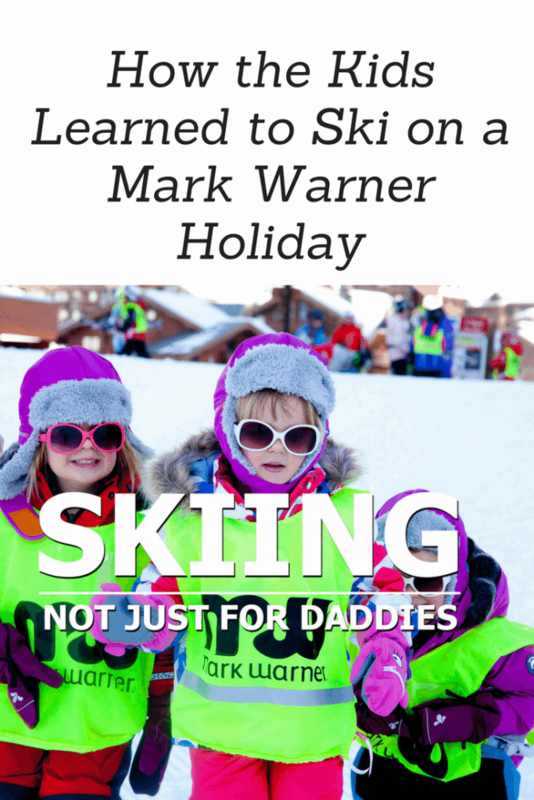 When we first started talking about skiing and entering to be a Mark Warner Family Ambassador for 2015, my girls said Skiing is just for Daddies, which is why we wrote our winning post Skiing – Not just for Daddies. 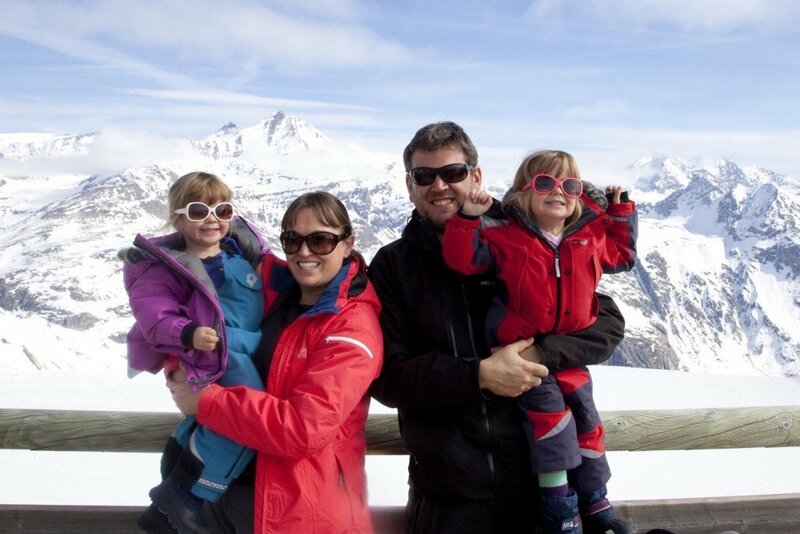 So off we set off on our holidays to try and prove that Skiing was NOT just for Daddies!. As we weren’t skiers it took us quite a while to get together all our ski gear, but thanks to some fantastic brands and wonderful friends, we set off on our ski holiday with all that we needed for a week in the mountains. If you would like to see a more detailed review of what we wore, please see the following posts: Me, Dad, Kids, Twins. 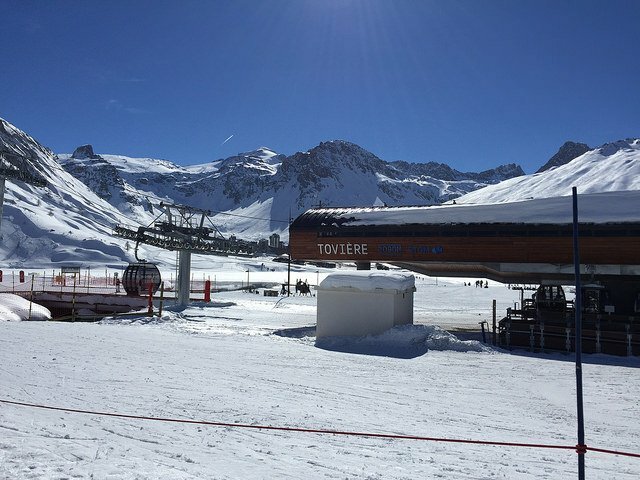 We arrived in Tignes to perfect weather. The skies were blue, the weather was warm, and there was some fantastic snow. 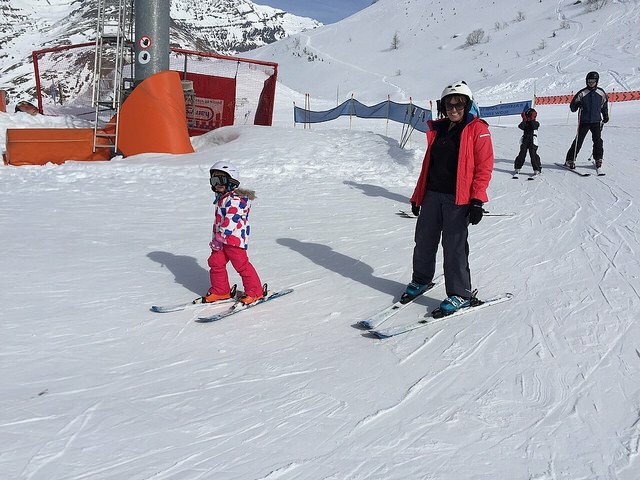 Now all me and the girls needed to do was learn how to ski! 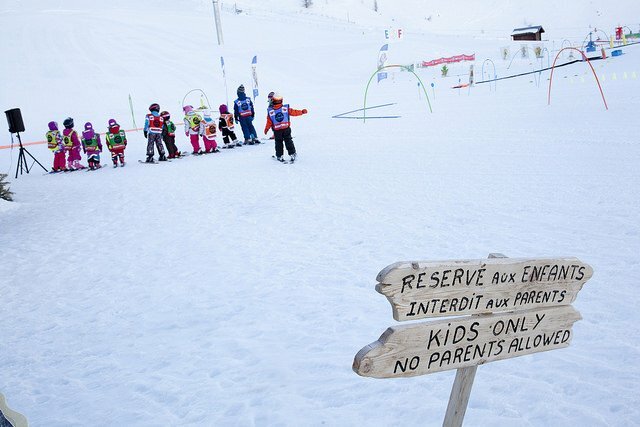 Les Marmottons very kindly offered to teach all my three girls to ski. 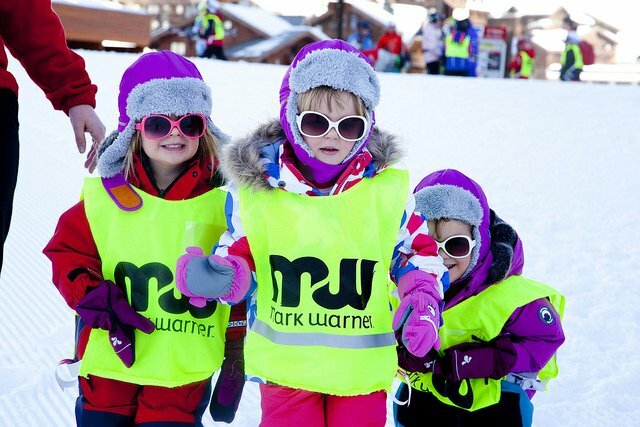 So on the Monday morning we dressed all the girls head to toe in their ski gear – they certainly looked the part – and off they went to ski lessons from 9-12. So did I. 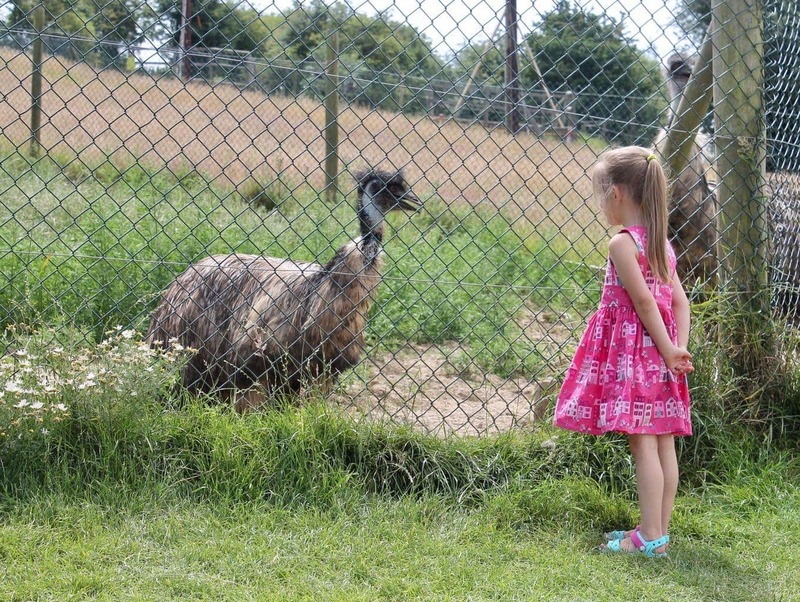 My girls were a lot braver than I was. I wandered off to my lessons, again kindly offered to me, this time by Evolution 2. I met my instructor and group of 5 other beginners and we set off to try and ski. I encountered a problem quite early on, as I realised my ski boots didn’t fit and I hurt my knee. I was devastated, was this going to be it for the week! I cried, I was worried, I panicked a bit. But I took my ski boots back to the shop, changed them for the right size (two sizes smaller than I had been given) and went back to the Evolution 2 shop. Don’t worry was the response. Just come back this afternoon and try again! We have another beginners group starting at 2pm. Perfect! So I went back to collect the girls at 12pm and wandered back with them for their lunch, they couldn’t stop chattering about their lessons. I had no idea what they had been doing (but then I never actually find out what they’ve done at pre-school either) but they were very happy, obviously excited, obviously starving, and clearly absolutely shattered! They went off to lunch with Jodie and I went off to have lunch with my hubby. What a civilised thing to do! So my ski lesson that afternoon was much more productive. 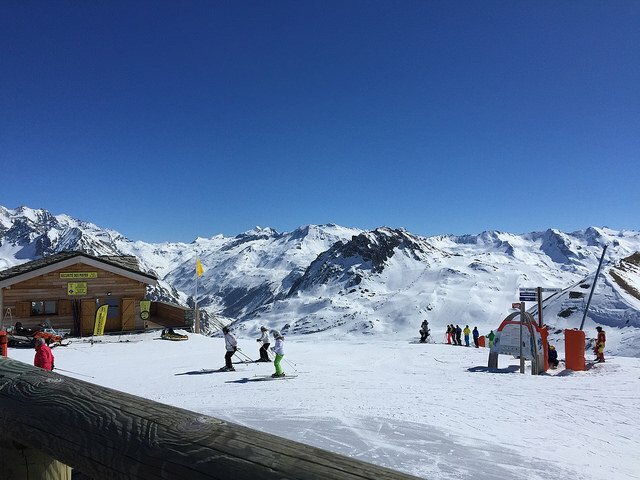 I learnt how to actually go down a slope and how not to fall off a tow lift! My instructor was keen to get us to the top of the mountains and to ski down by day three. I was a little unsure, wondering what was wrong with going up and down in the lovely new cable car across from the hotel! 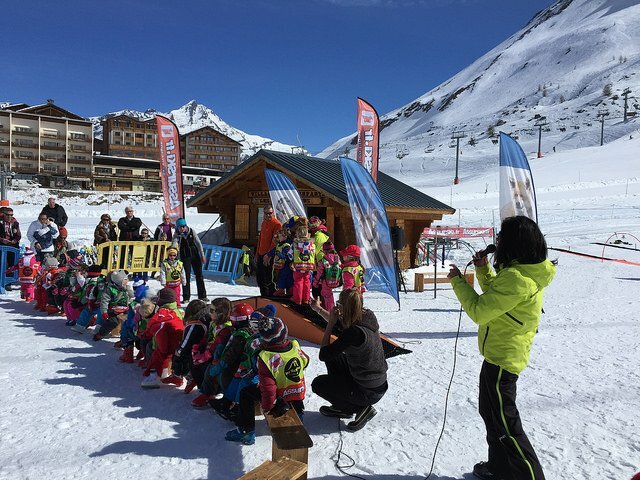 The issue for me with the ski lessons was that I ended up learning in the afternoon. This didn’t work as well for me as I didn’t feel able to go out and practice all morning as I’d be too exhausted for the afternoon lesson. It is exhausting trying to slow yourself down all the time (I really wasn’t very brave!). But by day 3 our instructor did have us on a chair lift up to the top of the mountain with a long blue run to ski down! I got down, eventually. Not very prettily, but I got down!! The next day I abandoned the ski lesson in favour of a trip out with hubby. This was a lovely morning (I think back fondly) At the time, I think I finished a run thinking ‘thank f*** for that’). I definitely wasn’t a pretty skier, but what I did love was the views, the air, the time at the top of the mountains looking around and drinking vino! 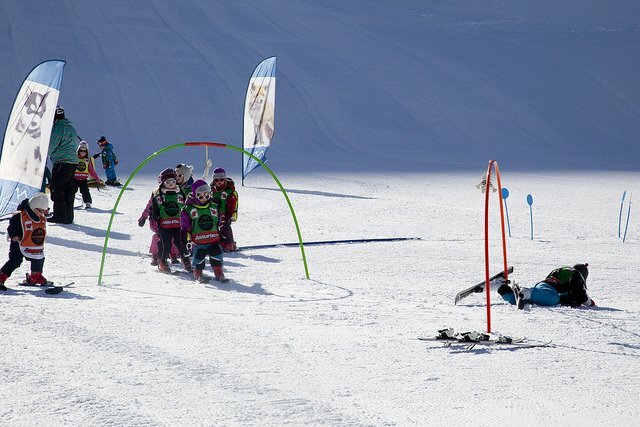 So whilst I was learning (sort of) to ski, what were the girls doing? Izzy and Eve were in a different group to Lily as they are 3 and they needed to be 4 to go into the group to do proper lessons. Izzy and Eve seemed to spend quite a lot of time going up travallators and skiing through hoops. This doesn’t sound very exciting, but they seemed to enjoy themselves a lot. I would also say that as an experience it was incredible and I was amazed at their confidence, going into lessons for 3 hours with French teachers whose sympathy when they fell was limited and who they couldn’t really understand. They seemed to take it all with a pinch of salt and lots of enthusiasm. Also whilst it didn’t look very exciting, to be honest I think it looked a lot more exciting than a pretend kitchen which mine can spend days playing with! So could they ski? Well when we took them out one afternoon to see how their lessons had been going, this was the result! So we spent an hour practicing trying to stay upright and then had a lovely time drinking hot chocolate in the restaurant at the top of the cable car run. Again I was amazed that the girls took all this in their stride, laughing at the ‘small’ people they could see on the ski slopes below them. Jodie told us she had seen that Lily had been taken to the green run with the tow lift, and that the medal she had been given meant she had done the green run with a little bit of help! 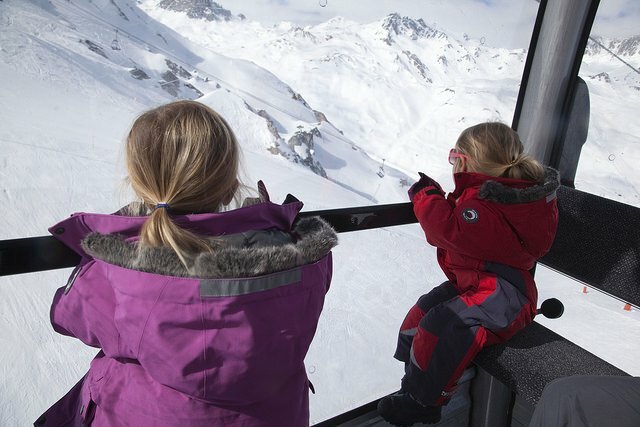 So that afternoon, Izzy and Eve went off for hot chocolate with Jodie and we took Lily skiing. It was the best part of the week. 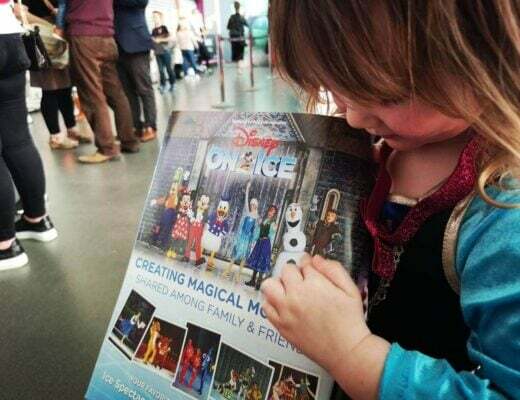 I was beyond proud of my four year old daughter. She was amazing. There was no fear. She just set off at the top of a green run and skied perfectly into the queue for the tow lift to do it again, and again and again. As I stood there at the top watching her, I had a tear in my eye, I was bursting with pride. So that afternoon, we did that green run quite a few times, before we decided, well Matt decided, to take her up to the top of the blue run back into Tignes. This was the very same blue run that the day before I had been terrified of. 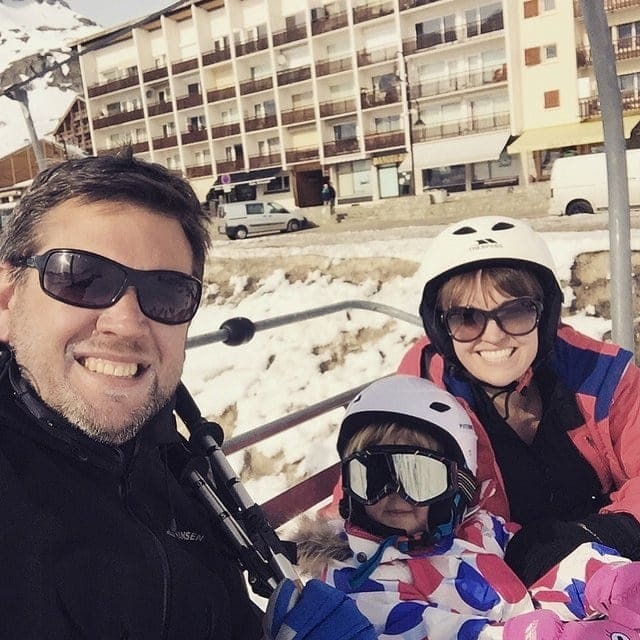 I couldn’t vey well admit that to may daughter could I, so off we all went on the chair lift! and this is how she did! I still can’t believe how fast she was! So that afternoon really made my week. 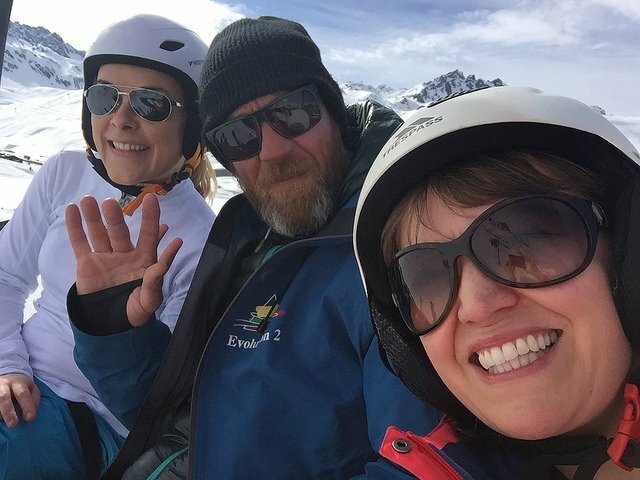 Being able to ski the three of us together was very special indeed. 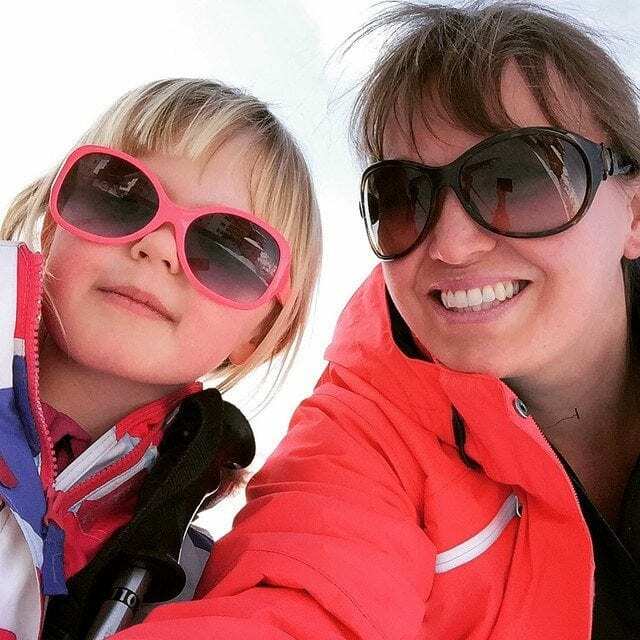 We had such such good week, and whilst we maybe didn’t prove that skiing was for this Mummy, we certainly proved that skiing wasn’t just for Daddies! 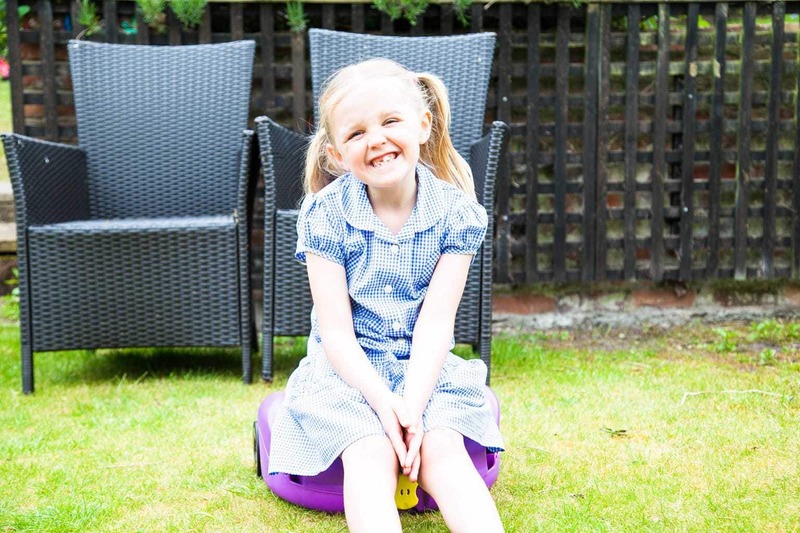 CarGo Seat: Travelling With Kids Is About To Get Easier! what a fabulous account of your skiing exploits. 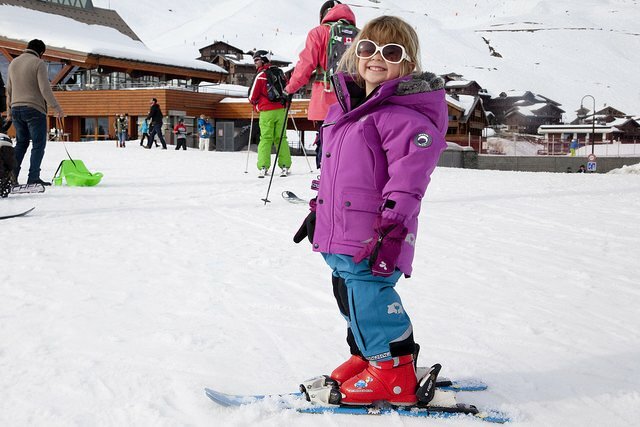 Oh to be able to ski like Lily!! Your girls are so brave and did remarkably well to learn so much in that time, must’ve had fab teachers. I would love to try skiing someday but I’d be more like you – pretty nervous!